Large item(s) 2 MAN DELIVERY UK Mainland Deliveries start from 7am until 7pm Standard Delivery: �34.95 Next Day Delivery: �49.95 We aim to deliver most products within 5 working days if possible; however some made to order items may take longer. Please note however that all delivery dates given are only and always provisional. Goods are subject to availability and delay in delivery of goods is sometimes outside of our control. All orders must be delivered within 28 days. When selecting our delivery service for your order, you will be shown a list of available delivery dates from which you can choose the most convenient for you. Certain postcode exclusions apply to this service - please see below for details. The delivery driver will also contact you in the morning of the day of delivery to confirm the approximate time. 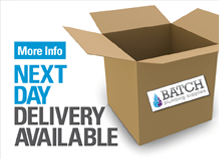 If you have any questions regarding your delivery please telephone 01278 788 145. Please note that if there are any items on your order that are currently out of stock then the complete order will be delivered when these items are available. However, if you would like the items in stock to be delivered immediately then please contact a member of our sales team on 01278 788 145 and they will be happy to arrange this for you. 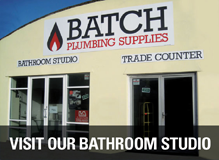 Batch Bathrooms strongly advise you not to book your installers or engage in any preparatory work until full receipt of your goods. 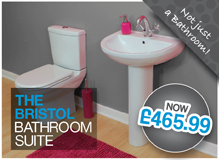 If any item is out of stock, a Batch Bathroom sales advisor will email or telephone you to advise you of the expected delivery date. If an order cannot be successfully completed due to the purchaser being unable to accept the goods on the date agreed, then a redelivery charge may be applicable. This cost would then be borne by the purchaser. If goods are ordered over the weekend or on a bank holiday the order date is taken as the following working day for delivery purposes. If a delivery would normally fall due over the Christmas shut down period the delivery period may be extended to a later date. After completion of your order please check your receipt and ensure that all the details are correct. If you are in any doubt please contact our sales department immediately as post delivery changes take time and can be an inconvenience to you. If your item is not in stock we will back order for you, or give you the option to cancel your order if you would rather not wait. Please ensure that all goods are checked by yourself and we ask that any problems are reported to our customer service team on 01278 788 145 within 72 hours of delivery. Provided you have notified us of a problem with the goods within 28 days of the date of delivery, then we will (subject to stock availability) make good any shortage, and replace or repair any damaged items. As soon as we have delivered the goods to your door you will be responsible for them. We will only deliver to the address on the order and goods will not be left without a signature unless authorised by the person named on the order. From the time of receipted delivery of the goods, any loss or damage to the goods shall be at your own risk. Delivery charges can be found under "Delivery Information" on our home page. 2. Returns In the unlikely event that you are not satisfied with your purchase for any reason, you have the right to cancel your order within 7 working days from the day after the date of delivery. To exercise your right of cancellation you must give written notice by post, email or fax, giving details of goods ordered and the delivery details. For full details of how to return goods please contact our customer service team on 01278 788 145. All non-faulty goods must be returned within 7 working days starting from the day after receipt of the goods, and we ask that all goods are returned safely, preferably in their original packaging. Please note that a collection charge will be implemented for all non-faulty returns up to a maximum of �49.95, and that this must be paid prior to any collection being processed. We will refund your money on orders within 28 days of cancellation less any delivery cost as detailed previously. Returns outside 28 days will not be accepted. Any returns notified after 7 days but within 28 days may be subject to an additional 20% restocking charge. On cancellation for any reason, you must return the goods at your own cost unless we agree otherwise or we confirm that you may dispose of the goods. Where the goods are being returned because they are faulty, incorrect or damaged then we will meet the cost of the return, but we ask that you allow us to nominate the carrier. Should you decide to return goods yourself via a courier service of your own choice then please note that this is done entirely at your own risk, and you should always ensure that you obtain proof of postage / delivery for your reference. Always inform our customer service team regarding the details of any goods you intend to return. Please note that we can only accept returned items from registered courier services, and that customers are unable to return items in person. With credit orders no returns are allowed after the 14 day cooling off period. If you have any questions regarding cancellations, or returns then please call our customer service team on 01278 788 145.